Luke Morgan and Jonah Holmes included in 37-man squad. New faces: Morgan, left, and Holmes. WARREN GATLAND HAS named uncapped backs Luke Morgan and Jonah Holmes in a 37-man squad for Wales’ four Test matches in November. Ospreys winger Morgan — who is Wales Sevens’ all-time leading points and try scorer — has scored four tries in five matches for his region this season, while Leicester’s English-born Holmes, who qualifies for Wales through a grandparent, scored 10 tries in 11 games for the Tigers last season. Gatland has the luxury of welcoming back eight British and Irish Lions to the squad which recorded three Test victories against South Africa and Argentina in the summer. There was no place for Rhys Webb, the scrum-half who signed for Toulon this season. 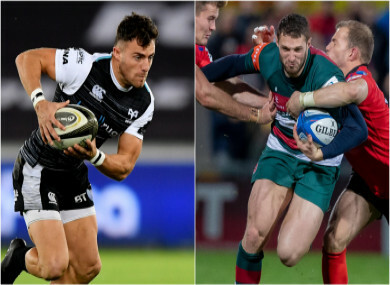 In his absence, Aled Davies, Gareth Davies and Tomos Williams, who all featured in the USA and Argentina in June, are named, alongside Dan Biggar, Gareth Anscombe and Rhys Patchell as the out-half options. “This autumn is the start of a 12-month countdown to the Rugby World Cup and it is a huge opportunity for the players,” said Gatland. “We have added in a lot of experience with eight British and Irish Lions coming into the squad so there is a lot of competition for places. “Some experienced players have missed out. The message to them is the door isn’t closed looking long term, it’s just a reflection of where we are depth wise and the opportunity to look at other players. Email “Gatland names two uncapped backs in Wales squad for Autumn Internationals”. Feedback on “Gatland names two uncapped backs in Wales squad for Autumn Internationals”.